In late 1940s Angela Ruiz Robles, a Spanish teacher, writer, and inventor, designed an analog device called the Enciclopedia Mecánica, which can be considered a fore-runner of the modern electronic book. 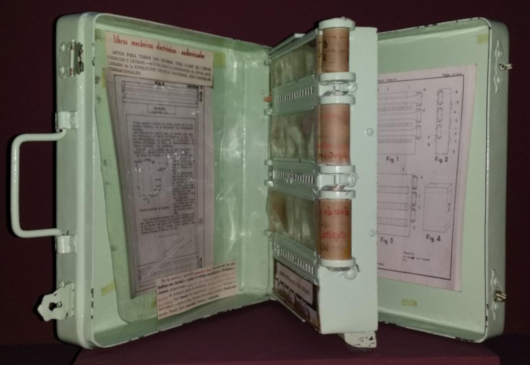 At that time, being the director of Instituto Ibáñez Martín in Ferrol, Galicia, Spain, Robles came up with the idea of a mechanical book that would allow to alleviate learning, with the minimum effort to achieve the maximum results. She thought that it could be achieved by making the learning more attractive and adapting it to the level and difficulties of each student. For Robles, learning was not about memorizing and reciting a lesson, but about reasoning and thinking about its contents. She wanted to design a lighter book that housed different subjects and that would support teachers to add their own materials. Robles imagined her mechanical encyclopedia as a small, lightweight, and easy for using machine. She imagined the school bаgs filled only with a mechanical book reader and nothing else. On 7 December, 1949, Robles filed a patent application Nr. 190698 (see the patent of Robles), under the title Procedimiento mecánico, eléctrico y a presión de aire para lectura de libros (A mechanical, electrical and air pressure procedure for reading books). Robles was convinced that her Mechanical Encyclopedia would transform the learning and she kept abreast of the payments for the annuities of her patent until 1961. But, in spite of the efforts she made, it was not possible to convert the old school books into the Mechanical Encyclopedia. Despite the failure, on 10 April, 1962, she applied for a new patent (Nr. 276346), for "apparatus for diverse readings and exercises". It had a slightly different design than the Encyclopedia, but retained the features that Robles believed essential. It was a portable, light and easy to use book, that combined the different subjects and was worth for students with visual difficulties. Robles did not manage to secure public or private funding for her second project also. As for content, Robles proposed alphabets and texts in several languages, structured in a logical manner and full of graphics, drawings, interactive games and spaces to write and draw. Each subject was loaded in the machine with a kind of durable plastic cartridges, manipulated by a turning a drum. Each cartridge could be read continuously or it could be skipped between chapters by simply pressing a button. There was an interactive index and a list of installed works on the machine. Robles also thought about the publishing market, imaging that there would be a wide range of works in the form of standardized cartidges that could be bought and added to the mechanical book, allowing the user to have at his disposal an authentic portable library. The interactive content was accessed through a panel of buttons, or a "menu" as we would say today, to jump between various topics, or "screens". The content could be visible in low light (e.g. printed in luminescent ink), and could be artificially illuminated. The book could include a kind of magnifying glass for people with visual problems. The augmentation system for the size of the text is also mentioned. There is a description of maps or drawings equipped with electrical circuits that can be illuminated by answering questions or explanatory texts, as if they were interactive infographics. The cartridges that made up the books, could be stored without problems once removed from the machine, they were contained in a kind of protective packaging, prepared and safe from dirt and moisture. For second patent a prototype was built in a military factory in Artillery Park of Ferrol in various metals and wood (see the upper image). It was the size of a book of 24 by 22 centimeters and a thickness of 6 centimeters, it weighed some five kilos. Its construction was feasible, it worked without problems, and it gathered in the space of a conventional book everything that the patent promised and more. The system allowed to save sound, and the student could listen to each lesson with the push of a button. Who was this intelligent and determined woman, who did not falter in her effort to do what she thought was right? Angela Ruiz Robles was born on 28 March 1895, in Villamarín, province of León. She was the daughter of Elena Robles, a housewife, and Feliciano Ruiz, a pharmacist. Angela studied at Escuela de Magisterio de León. After graduation at high school, she decided to focus her life on the teaching, and in 1915 started as a teacher in Leon, as among the subjects which she taught were stenography, typing and commercial accounting. 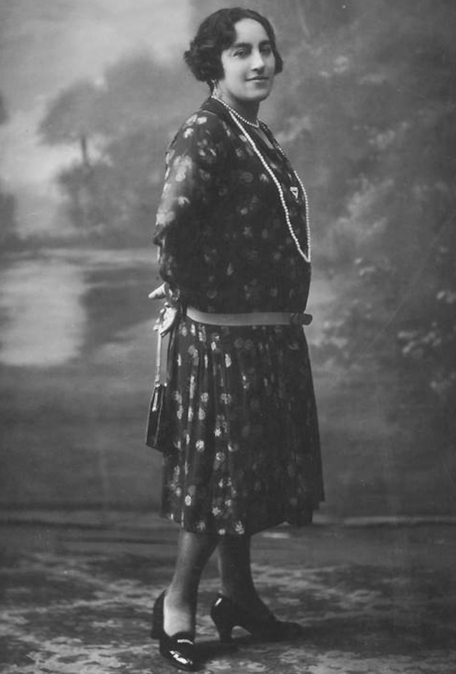 In 1917 Doña Angelita became a teacher and director of the school of Leon de Gordón and, a year later, she obtained a master's degree and got a teaching position in Santa Uxia de Mandiá in Ferrol, where she stayed until 1928. In 1934 Robles becomes the manager of the girls school of the national orphanage in Ferrol, Galicia. From 1938 Robles began to write his first books. In all, he published sixteen in his effort to help children study. 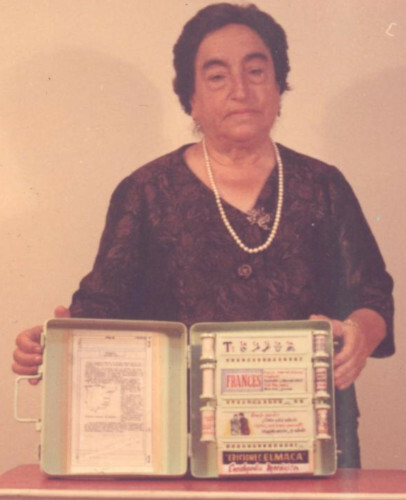 Being an inventive mind and facing many difficulties in her work as a teacher, Robles designed also several tools, as tachymecanographic machine, Grammatical Scientific Atlas (1944), and Enciclopedia Mecánica, which earned her several awards and national and international recognition, including the Oscar for invention at the Official and National Fair of Zaragoza (1957), the Bronze Medal at the International Exhibition in Brussels (1957), the Bronze Medal for educational innovation in Brussels (1958), the Silver Medal at the International Exhibition of Inventions in Brussels (1963), a Diploma and Medal at the Seville Exhibition (1964) and the Geneva Medal for Spanish inventors (1968). In 1947 Robles was awarded the Cross of the Civil Order of Alfonso X the Wise, in recognition of her social and educational innovation throughout her professional career. In 1959 she has been appointed as Managing Director of the Association of Spanish Inventors (ASIE) in Galicia and, since September 1973, provincial head of the International Scientific Inventory Polytechnic Federation. Angela Robles was married to a merchant seaman, but he died young. They had three daughters—Elena, Elvira and Maria del Carmen. The amazing woman Angela Ruiz Robles died on 27 October 1975 in Ferrol, A Coruña.